Seven classic Shakespeare plays presented in an accessible comic strip format. Take your place in the Globe Theatre of Shakespeare's day to see seven of his best-loved plays in performance. 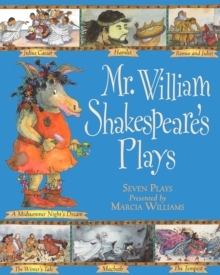 Romeo and Juliet, Hamlet, A Midsummer Night's Dream, Macbeth, Julius Caesar, The Winter's Tale and The Tempest are all brought vividly to life in Marcia Williams' gloriously accessible comic-strip versions, which include the bard's own dialogue and the rowdy remarks of the audience.